The thing about sourdough is that it demands regular feeding (either weekly or twice daily, depending on ambient temperature). Feeding isn’t really a problem – it’s rather like having a lack lustre pet – but it does necessitate a certain amount of discarding (unless you intend to invest in a sourdough pool). Of course, since waste isn’t an option a solution was vital. 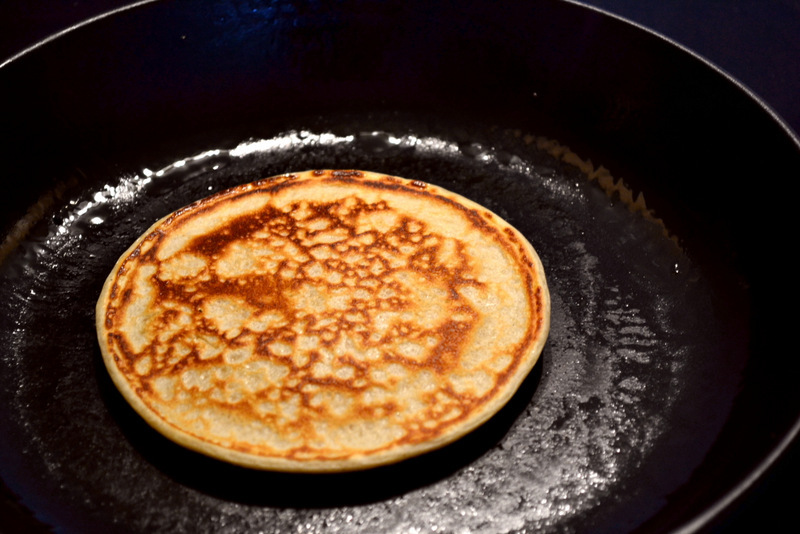 Happily, sourdough pancakes are strikingly simple, delish and make good use of starter otherwise destined for the bin. The recipe below is a very quick rendition and yields relatively mild pancakes. If you prefer something a little more ‘sour’ feel at perfect liberty to mix together the starter, flour and milk the evening before use to be left to stand. Either way, you’ll find them the perfect start to any day of the week – full of flavour and energy. Local connection: This recipe was made possible by Joanna of Zeb Bakes. Joanna is a Bristol-based food blogger and sourdough wonder who kindly agreed to provide me with my first starter. As such, any sourdough recipe that appears here is directly attributable to her fair hand! 1. Break the eggs into a large bowl, stir in the milk, flour, sourdough and add a pinch of salt. Melt the butter and incorporate too. 2. Heat a heavy-based frying pan and apply a small amount of oil across its surface. Use a ladle to tip in a little mixture at a time – cook on both sides until golden. Serve in a stack with a knob of salted butter. Cost: The beauty of this recipe is that it avoids unnecessary waste. As such, I’m loth to put a price on it, but these things must be done. These pancakes, which should feed four, will set you back around 80p – a bargain! I see that you like pancakes with your butter, Nick! 🙂 Aren’t sourdough pancakes just the Best? I’ve got some sourdough starter on the counter that I take care of like a pet…I think it’s time it gave me some pancakes….You’ve made me hungry for the weekend’s breakfast already. Even more sourdough envy from here Nick. The frugality is pretty awesome too, if you will pardon my American. What a smart idea to use up what would otherwise be wasted – besides if it means more pancakes, I’m in. However, my most lacklustre pet ever was the pet rock we had to “care for” in elementary (primary) school for a few weeks. There was probably a reason for it but for the life of me I can’t recall why. A sourdough starter seems positively animated after that! I just fed Sedrick. Pancakes for breakfast in the morning! Have you named your starter? I’ve often been intrigued by sourdough pancakes, but have never got round to giving them a go. I’m very tempted by your lovely photos though! Also, you have a real treat in store when you get round to baking your first loaf! Wonderful Nick! 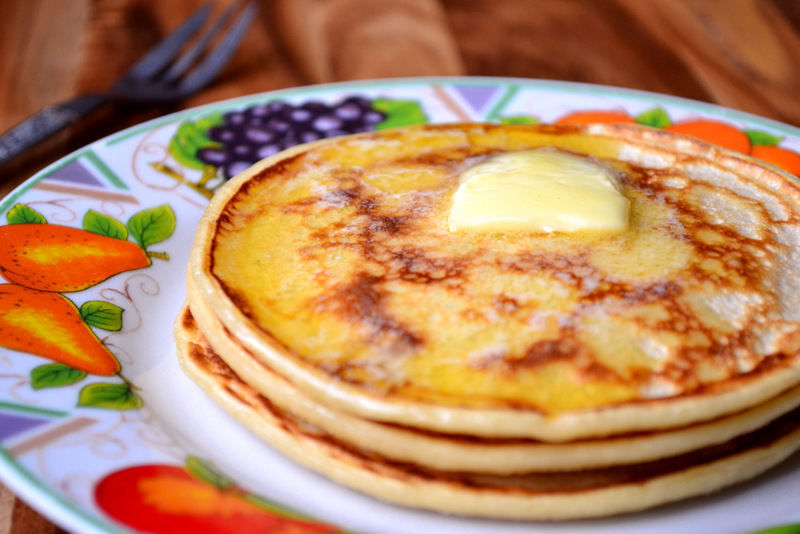 I haven’t worked with sourdough before – never thought to makes sourdough pancakes! Amazing! As always, you’ve got a brilliant idea here! I am attending a sourdough bread making class this month and can’t wait. I’ll have a go at these pancakes once I’ve got my little starter going! Smidge – hope you’ll be posting the results of your sourdough class ? Let me know if they have a good starter recipe please ! What an excellent idea! I love the idea of sourdough, but there does seem to be a lot of waste involved. This is a great workaround. Lucky you with getting the sourdough starter ! 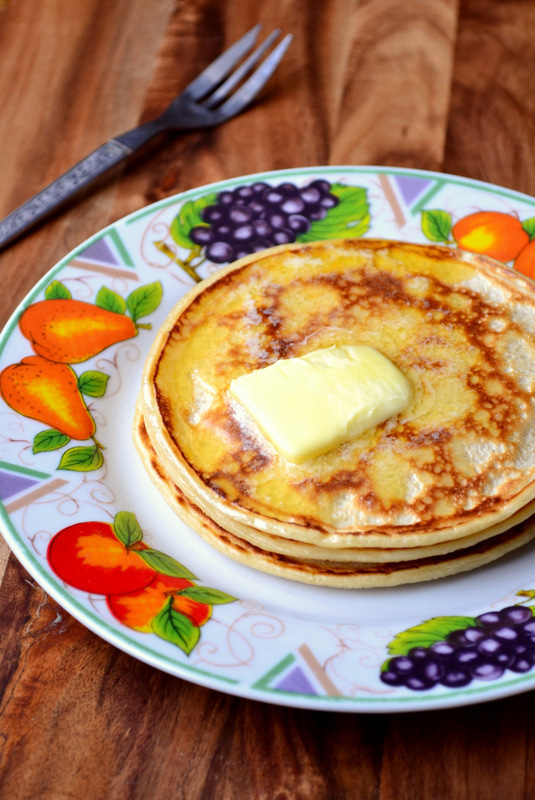 I have always fancied starting my own so I can make sourdough bread but your pancakes are a great idea too. And looking at the comments so far, looks like everyone’s getting on the sourdough train ! 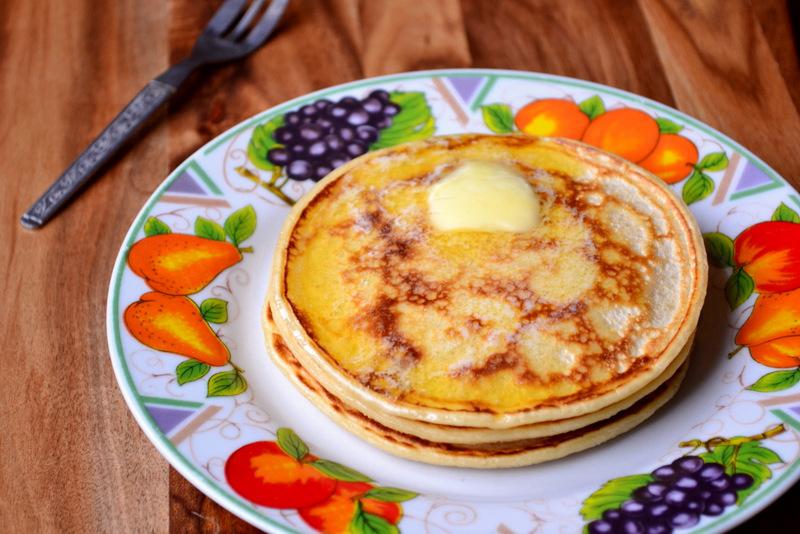 Love your plate and my family would love those pancakes! Thanks for the name check Nick! You can minimise waste by reducing the amount of ‘chef’ starter that you keep to a very small quantity. It will tick over quite happily on a weight of 50 – 100 grams of mixed flour and water. What is the cost of 25 g of flour? a few pennies? You can always dry the starter and grind it up and add it in to a yeasted loaf as a flavouring too if you get fed up with pancakes, though they look so good that might take you a while. This looks like a cultured breakfast! Fantastic idea! 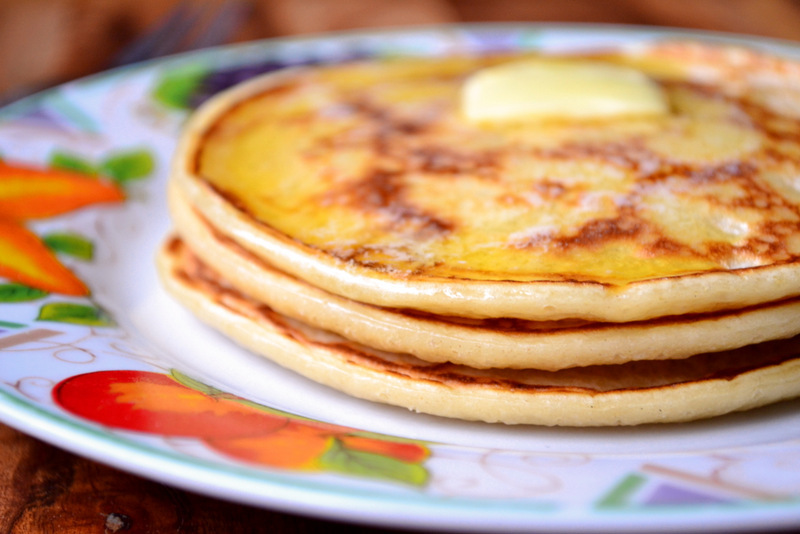 I’d never thought of using sourdough starter in pancakes… definitely trying it asap! Oh, I can almost taste them. Hi It has been a long time. I do not why but I was not able to receive your updates in the reader. Your recipes are always interesting and delicious. Thanks for sharing.